Emmanuel Boitier, Nils Karlson, Paul Richards & Raffaele Infante. I have a strong passion for photographing Landscape and Coast, but enjoy other commercial photographic work as well as providing tuition and occasional courses. 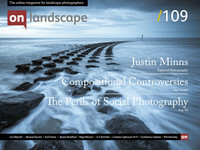 I’ve enjoyed reading Endframe throughout On Landscape’s history and have always been impressed how people have been able to select a single photograph, perhaps a defining one for them. So here I am having been put on the spot, not my usual naughty step. The selection process has been a chance to look at my photo books and rediscover some gems. Whilst my bookshelves don’t have the same extensive collection as others, a quick perusal would definitely give the game away that photography plays some part of my life on ‘Through the pinhole’. Very nearly fifteen years ago, I first saw ‘Contours in Blue’ on a Friday evening. The country was in the grip of Foot and Mouth outbreak and was I attending a residential course in Cornwall during the Spring of 2001 led by Joe Cornish. I had been loaned a Gandolfi Traditional 5x4 camera and was keen to get started on my Large Format journey. To start the course, Joe gave us a slide show using his medium format slide projector. I’d never seen anything so impressive in terms of picture content and fidelity, the colours were just so vibrant. He also showed us a wide range of Cibachrome prints. I felt so privileged to see such a high quality body of work. Two of them left me mesmerised, they were ‘Shell pocket, twilight’ which has an other-worldly feel to it and Joe explained how the fading light & rising tide necessitated his first use of painting by torchlight to illuminate the important foreground shells. And the other print was ‘Contours in Blue’. The picture is primarily wave-worn undulating grey limestone rock, with some pebbles and small pools of sea water that are in the process of drying out. And yet what we see is definitely not it what it says on the tin’s list of contents. A few months later, I visited The Joe Cornish Gallery in Stokesley, again these two stood out and being budget limited, bought a framed 20x24 inch print of Contours in Blue. Instead, through Joe’s vision and skill, we are presented with a wide range of blue hues, interlaced with a network of golden lines whose presence is further enhanced by deep blue sections in the contours. The yellow comes from the nearby cliffs that are bathed in direct sunlight, their colour is reflected in the water and wet sections of rock that have the right orientation. The blue comes from the clear sky overhead. These colours are enhanced in saturation by the use of Fuji Velvia transparency film. Camera viewpoint has been chosen precisely, so that the top of the cliff appears in the middle of the round pool on the left hand side creating two colours in one pool. The contours are deliberately placed at an angle to lead the eye effectively through the frame from bottom to top. At the base of the frame are an L shaped collection of pebbles, a dark wet patch of rock on the bottom right balances the L. In one of the pockets are 3 different sized pebbles and then there are more of them in the top left of the frame. It is an image made in what are generally agreed to be unfavourable conditions for photography; the middle of the day with strong winter sunlight and a clear blue sky. The lighting within the frame is entirely reflected, which helped keep the brightness range within the 3.5 stops usually associated with Velvia. It’s a superb example of having an idea for a picture that requires acknowledging and then overcoming a number of technical challenges. It would have been very hard to focus on the ground glass with a dark 300mm f8 telephoto lens at close range, necessitating a lot of bellows extension. This may well incur extra exposure for ‘bellows factor’ when metering. With the camera racked out like this, it creates a lot of sail area for the wind to buffet, requiring shielding it from the wind with body and jacket. Whilst there was sufficient front tilt to get the plane of focus along the rocks, even at f22 the cliff reflection is not in focus. If it had been, then I think that the resulting visible detail would probably have created distractions through the golden yellows being less homogenous. Conventional thinking is that the presence of a strong blue sky will need an 81 series warm-up filter to reduce the colour cast on the ground, in digital terms the Kelvin value to be increased in the white balance. I was interested to read in Joe’s book ‘First Light’, that Joe had shot the day before using an 81B warm up filter, but revisited the next day where he improved the composition and decided to leave it unfiltered to promote the blue cast without the benefit of being able to see what was on the undeveloped film. Through repeated use, a photographer learns to anticipate how Velvia will behave. The feedback loop is much more protracted (days, weeks or longer!) and expensive at £10 per shot (using 2 sheets of film) than the modern digital process of being able to instantaneously review on an LCD or upload to a calibrated monitor on a laptop. Despite all of this analysis, I normally just appreciate the picture for its sheer beauty, balance and calming nature, it still gives me pleasure to view on a daily basis 15 years on and hope that you too may well have enjoyed looking at it here.